For those of you who have stomach problems I highly recommend looking into the FODMAP’s diet. It has saved me and I can assure you it is not a fad diet, but a life changing diet. I used to have stomach pain every day, bloating, indigestion and constant discomfort. I went to doctor after doctor and it wasn’t until I saw a particular Gastroenterologist that he introduced me to this diet. Within a month I was not sore, I wasn’t constantly complaining and I was actually happy and enjoying food again. There are a lot of foods that must be cut out but I won’t go into that, it is easy enough to find information about it, however what I will say is that I had been searching for a book on FODMAPs written by Dr Sue Shepherd who is a specialist in this area. Recently I found it while holidaying in QLD and had to buy it. The great thing about this book is that is explains clearly what FODMAPs is, how different foods affect different peoples and then it gives suggestions on how to make such a diet part of your life even if you are also gluten intolerant, lactose intolerant, vegetarian or vegan. There are a range of great recipes at the back which I really wanted to try out. 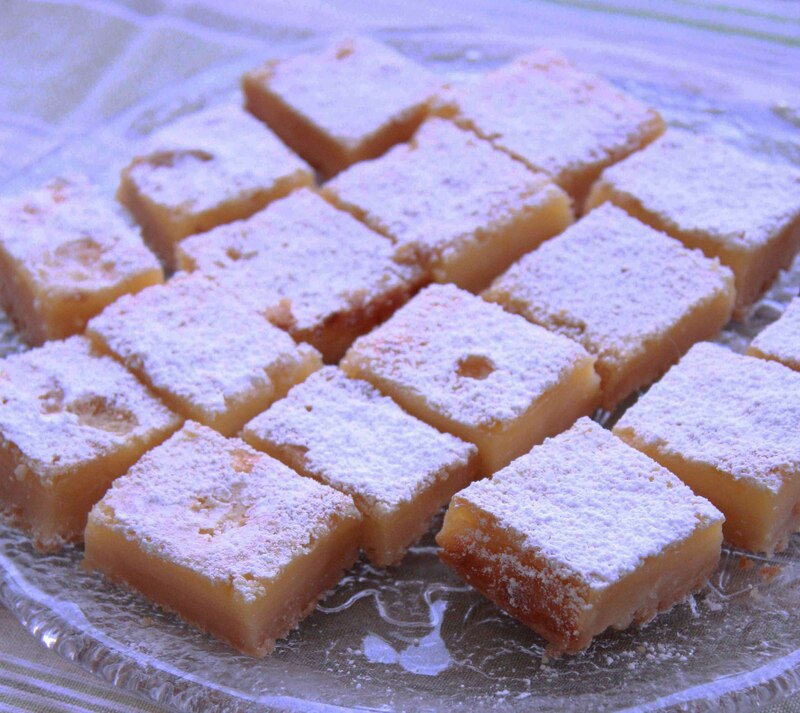 So this easter I thought I would make a dessert so I could enjoy it without feeling sick and decided that the items I had on hand were sufficient to make the lemon bars. It was really easy to make and actually didn’t require as many as I expected. It is as easy as making the base then pouring over a lemoney mixture, baking and cooling. Done. Easy peasy! It is even a great one for the kids to help with! 1.Preheat oven to 160 degrees C.
2. Mix flours, sugar and zest in a food processor to combine. Mix in butter until it starts coming together in a ball. 3. Press into a lined tin and bake for 10 minutes or until slightly browned on top. 4. In the meantime beat eggs and sugar in an electric mixer then add lemon juice, zest and flour and mix until well combined. 5. Pour over the top of the base and bake for 30 minutes or until lightly browned on top. 6. Let cool then dust with icing sugar to serve.